Choose 5 thoughtful blends of tea that matcha their personaliTEA! 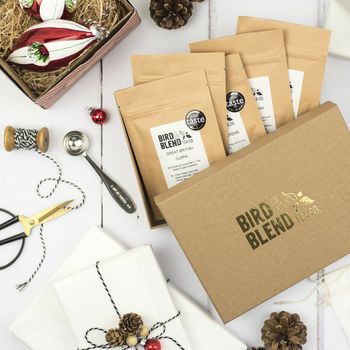 Pick & mix your own tea gift box for the tea lover in your life! 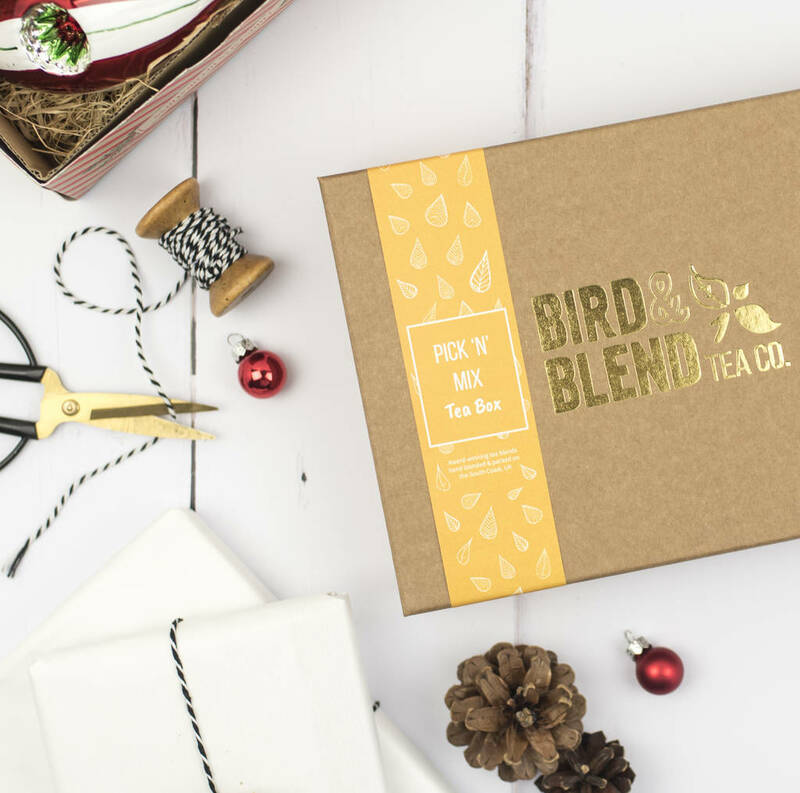 Presented in a luxury kraft box with an embossed gold effect, this chunky gift box doubles up as a great keepsake mini tea chest for future use! Each box will get up to 50 cups of tea which is up to 10 cups of tea from each pack, this will vary depending on which tea you choose. If you'd like a hand-written note, please leave your instructions in our comment box at the end and we'll work some magic! All teas are hand packed in an environment that handles nuts. All teas are vegan-friendly! Strawberry Lemonade Fruit Infusion: Apple pieces, hibiscus, elderberries, rosehip, lime leaves, strawberry pieces, sunflower petals, orange peel, natural flavouring. Earl Grey Creme: Ceylon black tea, vanilla pieces, blue cornflowers, natural flavouring. Great British Cuppa: Indian Assam black tea, Ceylon black tea, Chinese Yunnan tea. MojiTEA Mint Green Tea: Chinese green tea, peppermint, dried lime pieces, lemongrass, lime leaves. Rhubarb & Custard Rooibos: Rooibos, rhubarb pieces, calendula, flavour. Smoky Russian: Formosa oolong tea, Lapsang Souchong tea, Mao Feng Keemun tea. Nearly Nirvana Jasmine White Tea: Chinese white tea, Chinese green tea, jasmine blossoms, spearmint, orange blossom. Gingerbread Chai: Rooibos, cardamom, cinnamon, ginger, vanilla pieces, mallow flowers, flavour. Morning Kick Lemon & Ginger Infusion: Mate, lemongrass, lemon verbena, ginger, lemon peel, calendula. Dozy Girl Chamomile Tea: Chamomile, lemon verbena, hibiscus, rose petals, lavender. Triple B Builders Breakfast Tea: Assam, Ceylon and Kenyan black tea. Deckchair Dreaming Valerian Tea: Chamomile, apple pieces, rosehip, linden blossom, hibiscus, valerian, orange peel, natural flavouring. Enchanted Narnia Raspberry Leaf Tea: Rosebuds, cocoa shells, rose petals, lemongrass, raspberry leaves. The Digester Tea: Chinese pu'erh tea, Chinese oolong tea, ginger, orange, ginseng, fennel.